Register by Sept. 6 to join the Philly Fun Fishing Fest on Sept. 8. ADA and SEPTA access. For many who enjoy the ancient pastime and sport of fishing, the passion comes from a place with deep roots in childhood: fishing with a dad or a grandmother, remembering just the right number of times to loop a line for that most steadfast of knots, remembering the little secrets they passed on for luring in the big one, remembering the frenzied excitement of that first catch, forever cherishing the picture snapped after. On Saturday, September 8, Philly families will have the perfect opportunity to create those memories—even if no one in the family has a lick of fishing know-how. Now in its 14th year, the catch-and-release Philly Fun Fishing Fest at Schuylkill Banks in Center City is an event that’s special because it goes out of its way to be open to all, inviting experienced anglers and newcomers alike to see first-hand just how much our scenic Schuylkill River has to offer. All you have to do is register right here by Sept. 6: if you don’t have your own, bait and rods are loaned on a first-come, first served basis. As our partners, the Pa. Fish and Boat Commission will even lift fishing license requirements for that section of the river during Philly Fun Fishing Fest. Saturday, September 8, 2018 from 7 a.m. - 11 a.m. 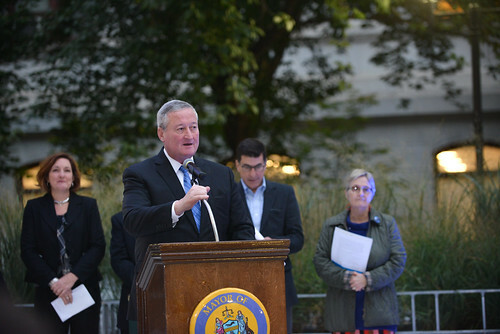 Awards ceremony starts at 11:30 a.m.
That’s why PWD, Mayor Kenney and our partners across City government put the spotlight on community groups, nonprofits, businesses, organizations and residents when we celebrated the 1,000th Greened Acre created under Green City, Clean Waters. The diverse group of people and organizations at the City Hall 1,000 (Green) Thank Yous celebration was a real tribute to the dedicated coalition that’s working to protect Philadelphia’s water. Much more than a number, the 1,000 Greened Acres you helped us build represent a true transformation of our urban landscape, one that’s having a positive impact on our waterways. Today, green tools can keep nearly 28 million gallons of polluted runoff out of our rivers during just one inch of rain—an amount that can add up to a billion gallons of stormwater and sewer overflows not going into our waterways annually. We still have nearly two decades to go before we reach our final goal—9,564 Greened Acres by 2036—and PWD looks forward to growing and strengthening the partnerships it will take to achieve rivers and creeks that are cleaner than they’ve been in generations. Help Get a Buoy for Lake Erie! The Regional Science Consortium is in the running for a Grassroots Grant from the Boat U.S. Foundation and needs your vote to win the grant! If selected, the Regional Science Consortium plans to use the grant money to support the Weather, Water and Wave Buoy System that will be deployed this May in the Pennsylvania waters of Lake Erie. This buoy will provide real-time data (every 20 minutes) on the lake conditions that everyone can access. The buoy system will be a tremendous benefit to the local community as well as to tourists. Find more information on the water quality buoy. Click here to vote for the buoy system in Pennsylvania at Lake Eire. You can vote once every day until March 28th.